Balvihar Hindi School, the culture and language school run by World Hindu Council of America (VHPA), Atlanta Chapter, recently held its Annual Cultural Program at Berkmar High School. There were over 200 participating kids from the two branches of Balvihar, Cobb and Gwinnett County Balvihar. The program showcased the varied talents of not just the students, but also the teachers, parents, and volunteers who put together their most creative ideas to produce a colorful and entertaining program. The Balvihar cultural event is an annual tradition that gives students a chance to express themselves artistically, build public speaking skills, and learn about the rich history and culture of India outside of a traditional classroom setting. Every year the program is based on an educative theme related to India, this year the dual theme being "Inspirational Youth Personalities of India and Folk Dances of India." In the past, themes have been "History of India," "Hindi Literature," "Nav-Ras," "Children's Literature," and "Ram-Leela," among other things. The vibrant theme of this year allowed for some great plays, interspersed with a variety of folk dances from all corners of India. Kusum Khurana, President VHPA, Atlanta Chapter inaugurated the program by lighting the ceremonial lamp. The opening prayers were presented by the students of the graduating class. The cultural program took off with a Bharat Darshan Jhanki, presented by youngest students of Balvihar, the 4-5-year-olds dressed in traditional Indian outfits from different regions, to the tune of the famous song "Aao bachchon tumhe dikhayen." This was followed by a series of plays and dances based on famous youth characters from the Puranas as well as characters from Indian history and folklore, each character representing the cultural values that are revered in Hindu Dharma and Indian society. The characters of Luv-Kush, Bhakt Prahlad, Dhruv, Shravan Kumar, Bhakt Andaal, and Shishya Aaruni were brought to life by the kids with well rehearsed dialogues and ingenious stage props and backdrops. While Luv-Kush handled an almost life size replica of the horse from Ashwamedh Yajna, the portrayal of Shravan Kumar carrying his aging parents in straw baskets gave an equally realistic picture. The flawless narration of Dhruv's story and the soulful acting by the student artists was greatly appreciated by the audience. The pure and innocent devotion of a little girl "Goda" was presented most effectively in the play Bhakt Andaal. Most importantly, the moral of each story, be it the courage of Luv-Kush, the devotion of Prahlad and Andaal, the tenacity of Prince Dhruv, the concept of ideal son Shravan or the ideal student Aaruni, was conveyed in a powerful audio-visual mode, to the young students sitting in the auditorium as well as the students enacting these roles. What better way to instill cultural values in our children and to protect and preserve our culture? The program continued its journey into the history and culture of India with a couple of historical plays: Chandragupt Maurya and Chanakya, and Jhansi Ki Rani. The plays were enacted very well, highlighting the leadership qualities of a young Chandragupt and the fearlessness and patriotism of Jhansi ki Rani Lakshmi Bai. Jhansi Ki Rani got a huge applause, especially on the emotionally charged famous lines "Main apnee Jhansi nahin doongee!" These enactments, while giving valuable lessons in history to the student body in the audience, created nostalgia for most adults, a reminder of their good old school days back in India. While the older students presented the plays, the younger students contributed to the cultural evening with folk dances from different regions of India. The entertaining collection of performances included a dance on the famous Kashmiri folk song "Bhumro, Bhumro," a beautiful garba, and the age old traditional dindi and lezim dance from Maharashtra. A fast paced Rajasthani Holi dance had the crowd clapping and of course the undisputed king of all dances, the bhangra, was enjoyed by all. A dance on the sweet and melodious Vraj-Bhajan "Chotee chotee gaiyya" depicted the beloved Bal-Krishna, playing with Gop-Gopis. On a slightly different note was a dance on AR Rahman's “Bharat Humko Jaan Se Pyara hai,” which unfailingly invokes a sense of pride and love for the homeland of India. Another great item was the theme song of Project Green Hands of Tamil Nadu, which was first sung on World Environment Day, 2004. The little kids dancing with painted earthen pots drove home the importance of planting trees and caring for them. A short dance drama based on Tamil folklore, of an old woman who thinks the Sun rises because of her rooster's call, was enacted most enthusiastically by a group of students. The costumes and the village scene complete with huts and an old fashioned brick well, made the scene quite authentic. Last but not least, the grand finale was the marching of all students, teachers, and volunteers onto the stage, to the tune of “Vande Mataram.” The vote of thanks was presented by Madhav Katdareji and Surindar Dharji, coordinators of Gwinnett Balvihar and Cobb Balvihar respectively. The program was emceed by the students of the graduating class, as is the tradition of Balvihar. A most notable fact was that the backstage, props, and curtains were all managed most efficiently by recent graduates of Balvihar. These student volunteers ran a perfectly coordinated backstage team, their duties including getting the correct group of artists on stage on time and escorting them back to their seats after their performance, which is quite a challenging job, with 16 different items and children ranging from 4-year-olds to high school teenagers. The teachers and parent volunteers helped with the rehearsals and making of the realistic stage props. The dedicated team of volunteers of Balvihar and, of course, the supportive parents made this event a great success. 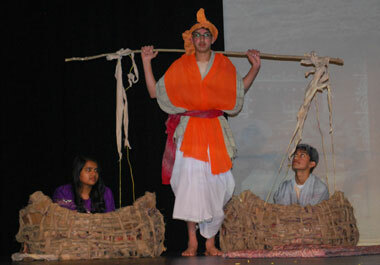 The annual cultural program of Balvihar, a nearly 25-year-old tradition in the Atlanta region, is an essential part of the school's curriculum. Participation is mandatory for all students and each student gets his/her share of the spotlight on stage. This plays a vital role in building confidence among students, improving proficiency in speaking Hindi and learning to work as a team. The cultural program presented by each class is integrated with the class syllabus. Student learning continues as they practice their items, be it vocabulary through the songs or reading through the dialogues. The outcome of this cultural event aligns most effectively with the overall goal of the Balvihar program, to teach Hindu culture and values and the Hindi language, to children. However, the invaluable fringe benefits of such programs are the real-time lessons on teamwork, working for a common goal, and stepping up to the occasion, which even the most professional team-building event can only simulate. Visit www.balvihar.org for the latest info and pictures.